Why it’s happening: Regular work-from-home time among the non–self-employed population has grown by 103 percent since 2005, according to Kate Lister, president of Global Workplace Analytics, a San Diego–based research and consulting groupfocused on workplace change. Her organization estimates that number will continue to grow at between 10 percent and 20 percent a year.How it will impact you: More of your clients are likely to need a work-from-home space, but due to the diminished size and highly transient nature of technology tools, there’s less need for a dedicated, separate office. Brad Hunter, HomeAdvisor’s chief economist,says almost any area of a house can become a workplace, but the most functional ones incorporate built-ins and furnishings that serve a dual purpose. 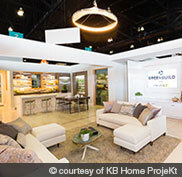 That same desire for flexibility may someday translate to layouts that can easily change to a homeowner’s whim, such as the KB Home ProjeKt movable wall concept in its “Home of 2050” at the Greenbuild Conference and Expo this past October.